“An early bird catches the worm”, goes a famous adage. So true! 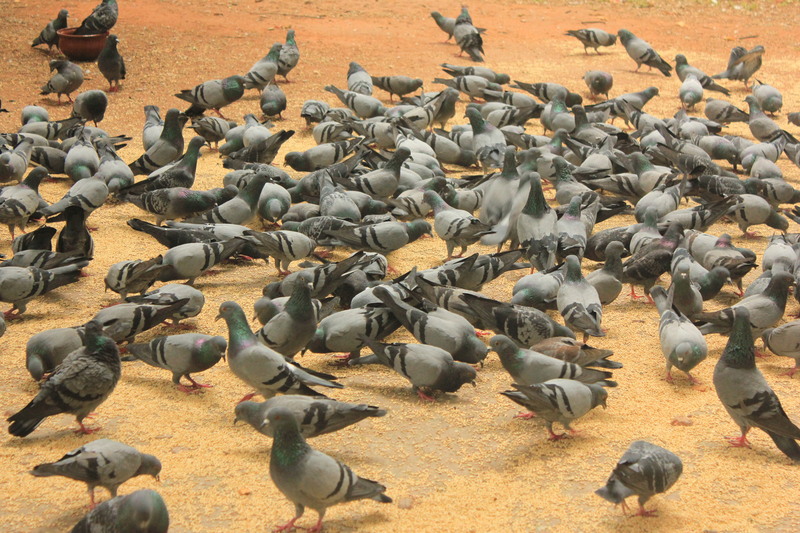 Early-to-rise pigeons at Cubbon Park in Bangalore are showered with a bountiful of grains by kindly morning walkers. The bougainvillea sapling planted by my father more than a decade back has grown into a large tree and spread its branches all over my home. Like all trees it supports a lot of biodiversity. 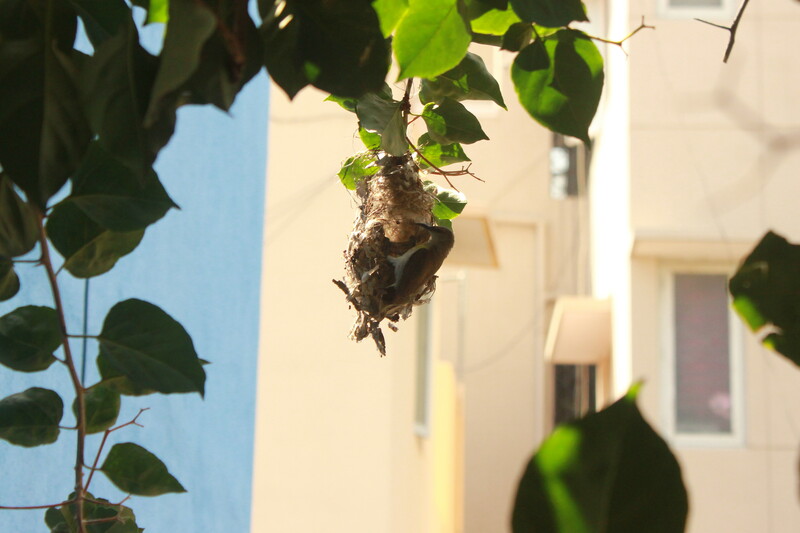 Last week, I noticed a female Purple Sunbird (Nectarinia asiatica) building a nest at the tip of one of the branches. 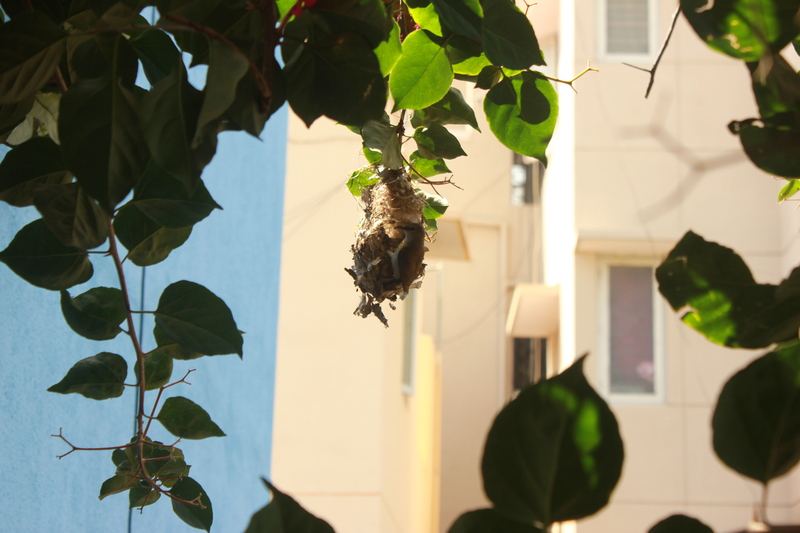 I had never seen a bird build a nest before. 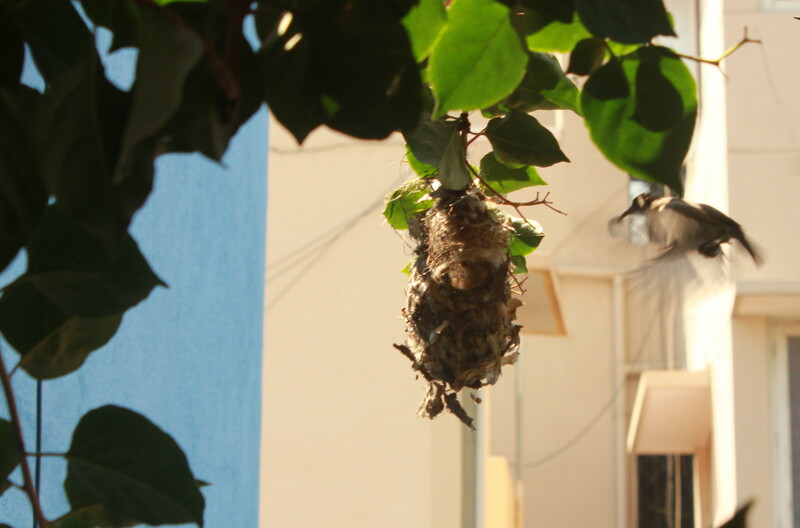 The hard-working bird finally ended up building a neat egg-shaped dwelling with dry leaves, tree bark, twigs, cottony stuff and the like with an entrance just big enough for her to enter. 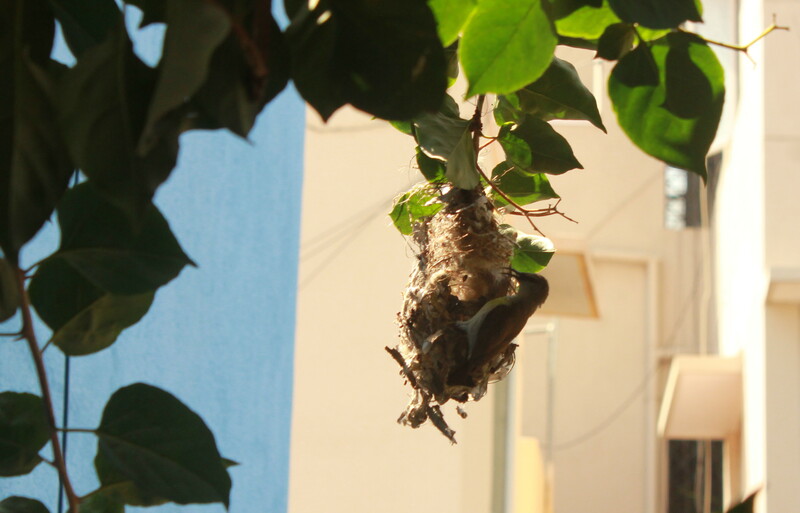 When there’s a breeze, the nest at the tip of the branch gently sways making it look like a pendulum. 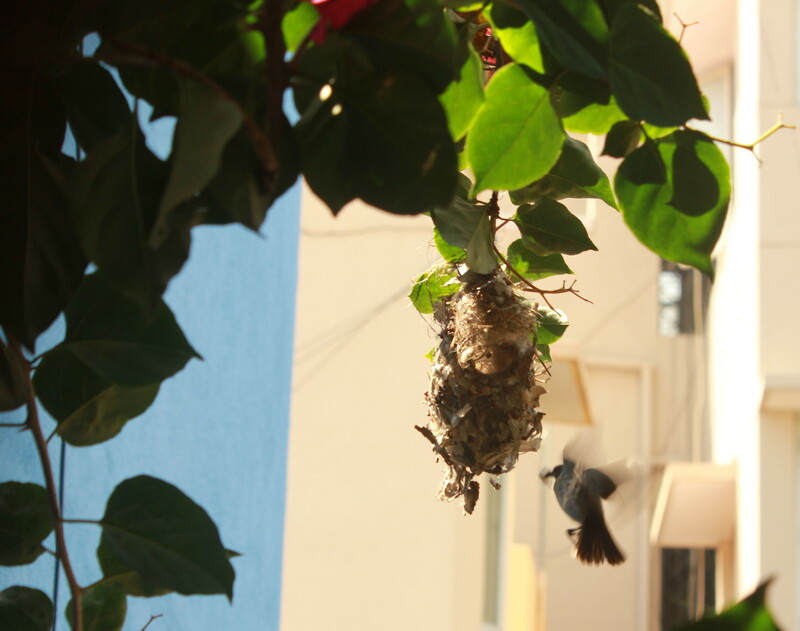 I decided to take pictures of the bird as she flew back and forth from the nest. It proved to be a case of so near yet so far. 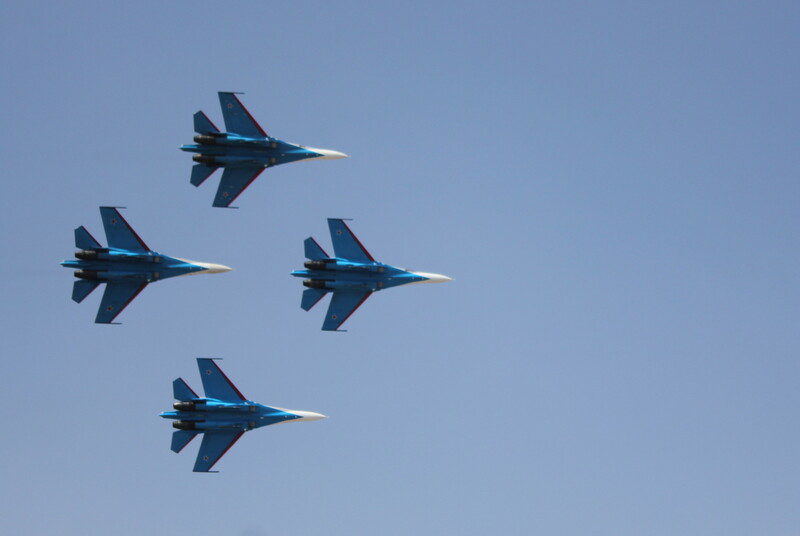 I couldn’t do much with my 18–55 mm lens. 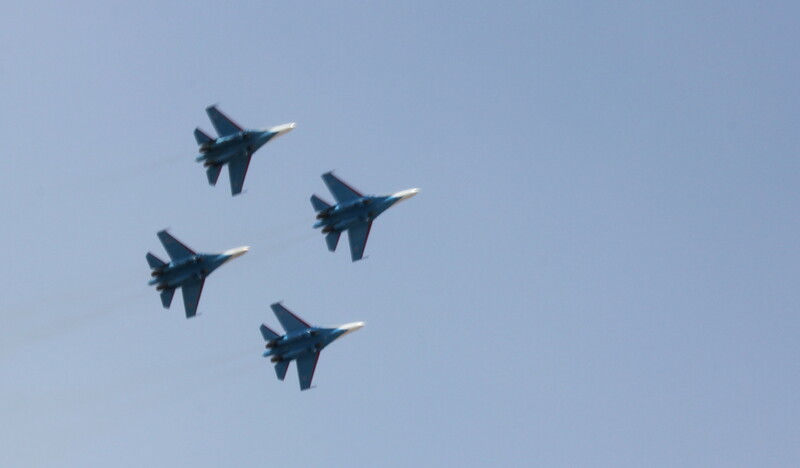 Apologies for the pathetic shots! 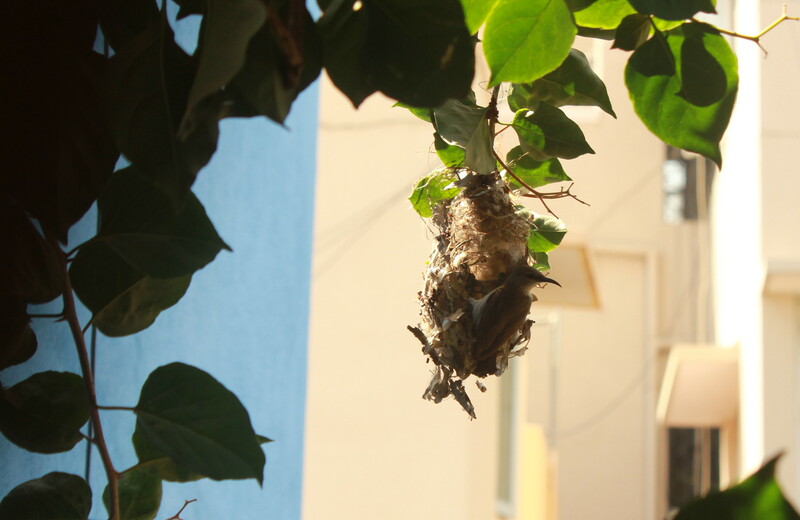 Cheewit cheewit … cheewit (That’s the call of the Purple Sunbird.)! I perched on a step ladder and watched my little friend for close to half an hour as she made small trips to fetch food for her little ones. After about five trips she flew far away. I could hear her calls from a distance. The babies could have probably been fast asleep then and by the time they woke up mamma would return with some goodies. I can’t wait to watch her homecoming. Cheewit cheewit … cheewit would be music to my ears! 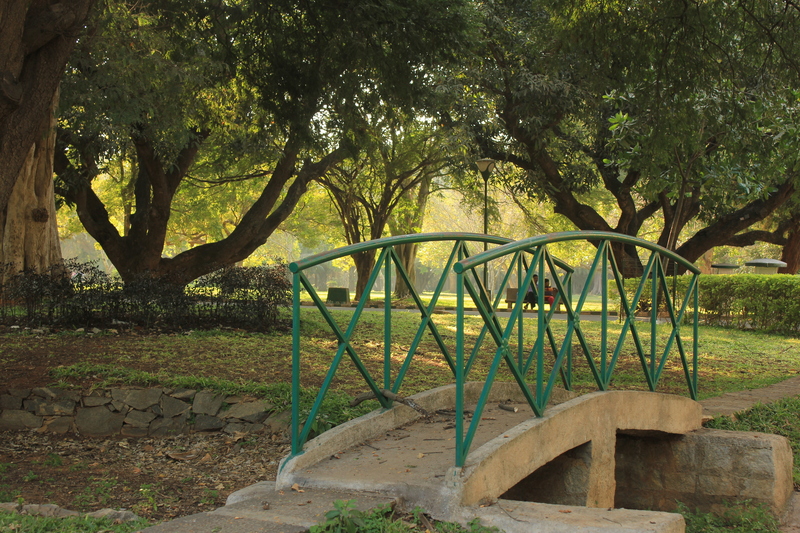 Like last year I made the most of a lovely February afternoon at Lal Bagh. 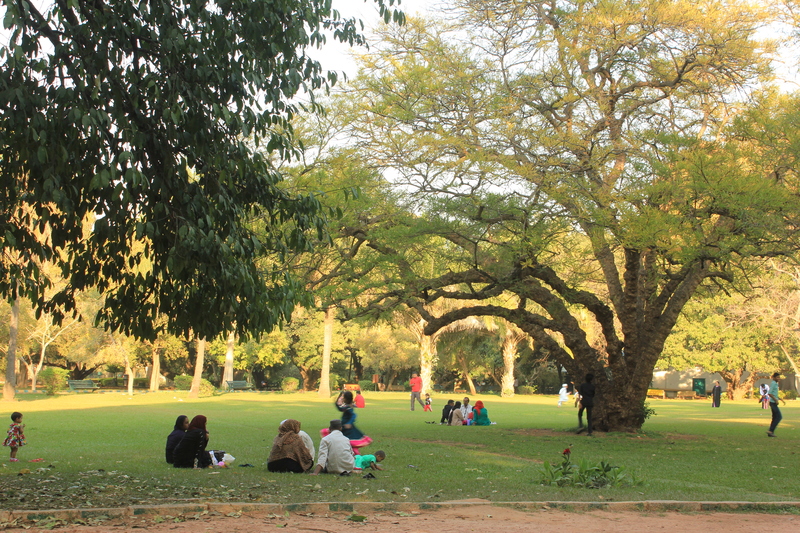 The month of love is an apt time to celebrate the trees and greenery in one of the Garden City’s most beautiful spots. 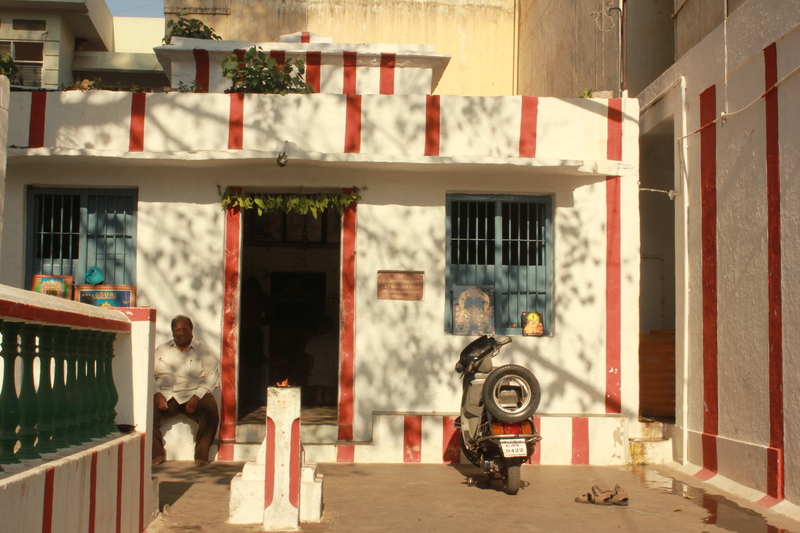 The day being a festival day (the Hindu festival of Shivarathri) there were more visitors than usual. There were a lot of children picnicking with their doting parents. 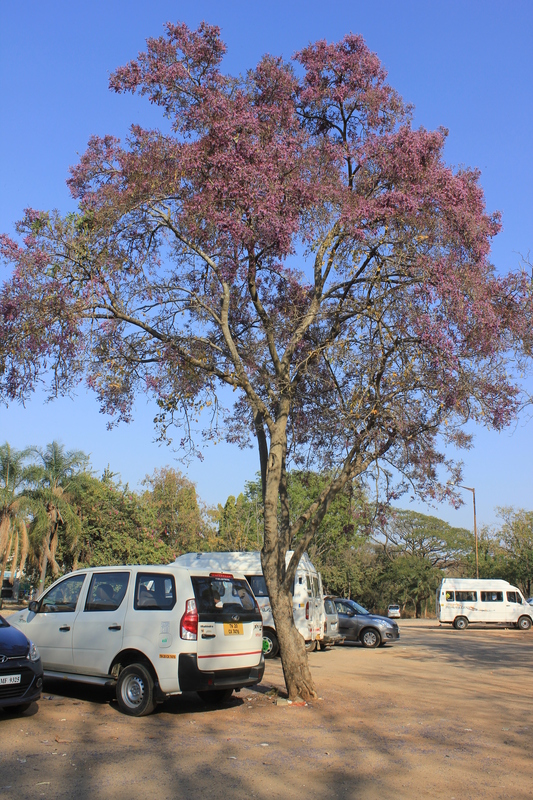 I first headed to the parking lot to catch a glimpse of the purple blooms of the Moulmein Rosewood trees and the pink blooms of the Mother of Cocoa trees. The trees in full bloom looked as gorgeous as they looked last year. Young boys making merry under a tamarind tree revived childhood memories of holidays spent under tamarind trees at my ancestral home in Kerala. 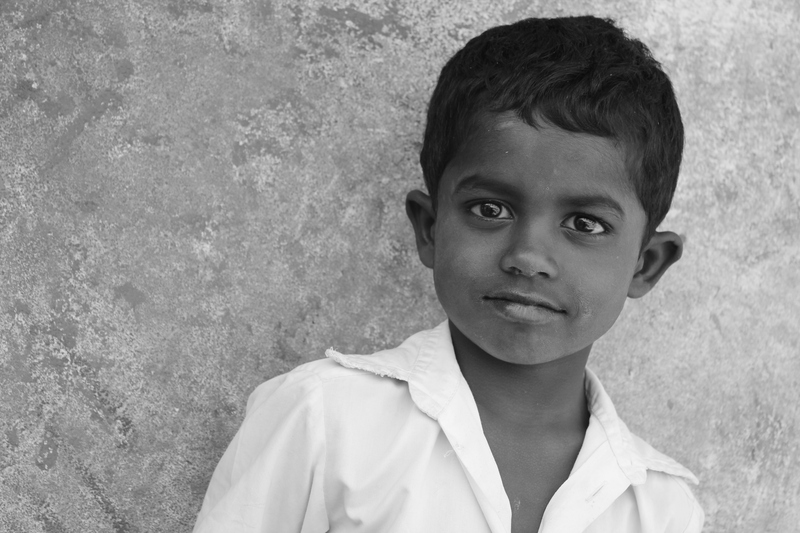 While my cousins relished the raw fruits I found it difficult to even sink my teeth into them. The sourness would make me squeal and jump. This little fella was running around restlessly probably searching for food. February also happens to be leaf-shedding time for many trees. Here and there I was welcomed with a shower of dry leaves. How much I enjoyed it. 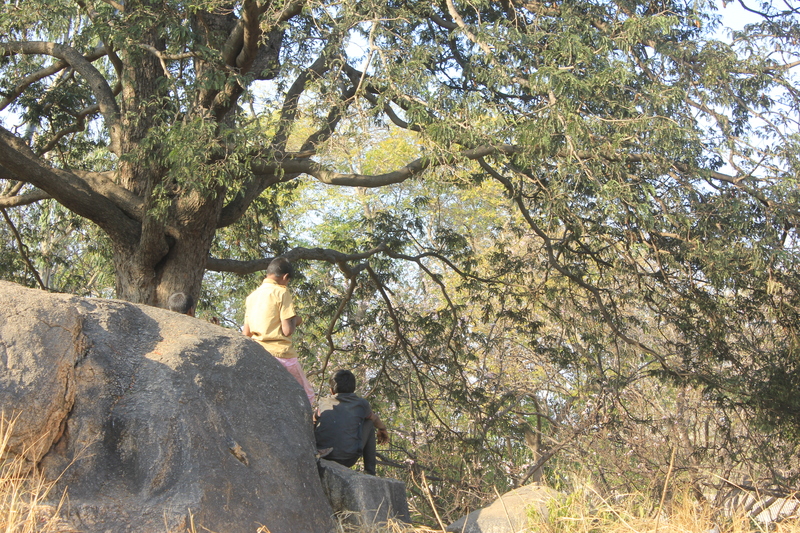 And the calls of barbets were there everywhere. 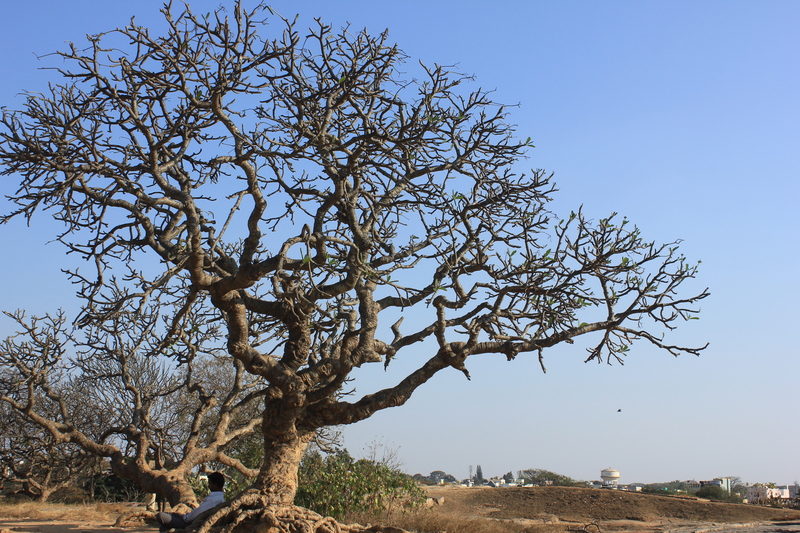 I couldn’t figure out why this man chose to rest under a leafless tree that too when it was so sunny. The canopies of some trees reached for the skies. Some of the statuettes used at the recent flower shows had made their way to the Seed Testing Laboratory. 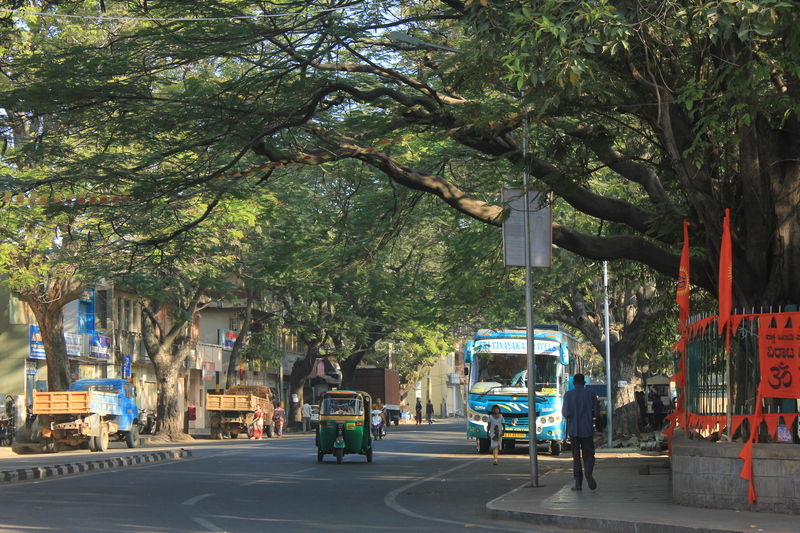 There are quite a few White Silk Cotton trees in Lal Bagh. This one stands tall near the Seed Testing Laboratory. Don’t miss the amazingly broad trunk. 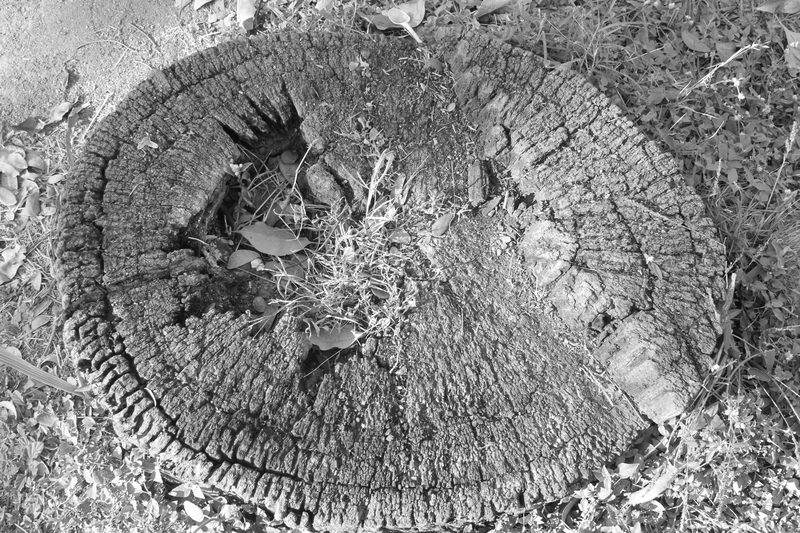 Very close to the majestic tree I spotted the remains of what was once a beautiful tree. 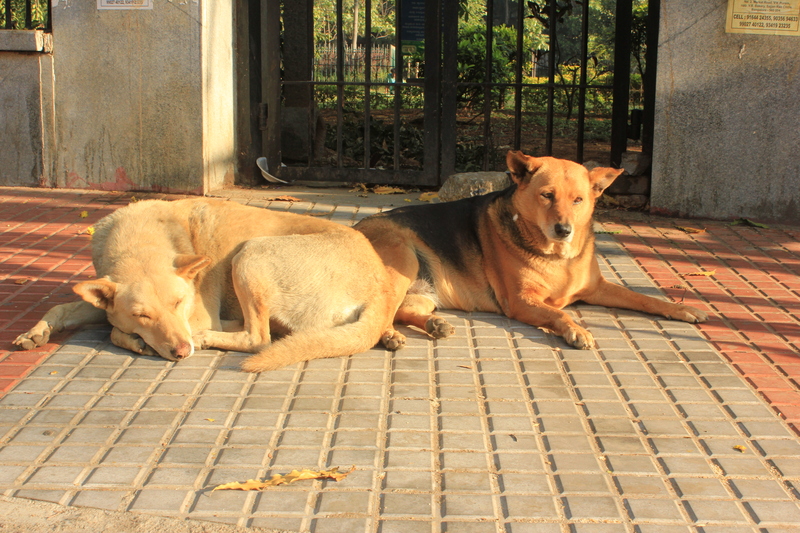 The shady grove and a dry leaf bin turned out to be a perfect place for some dogs to relax. This Japanese bridge added to the beauty of the landscape. 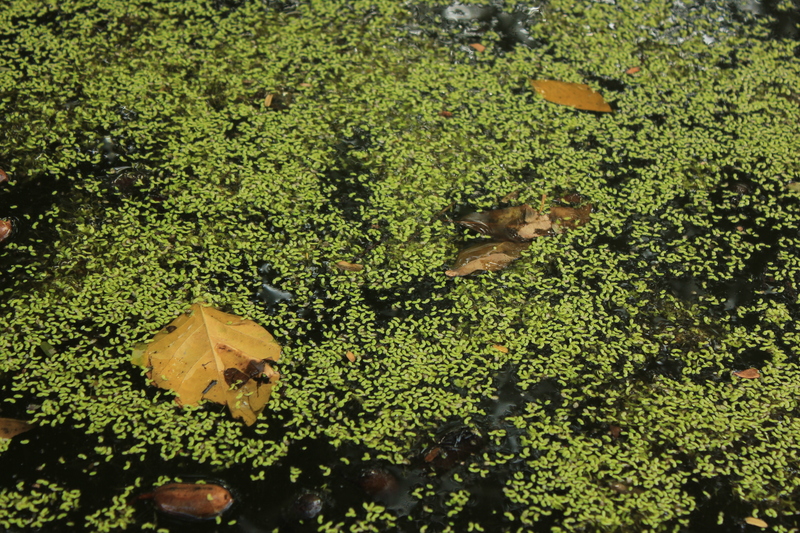 The pond adjacent to it was littered with dry leaves, tamarind fruit, wisps and green matter. 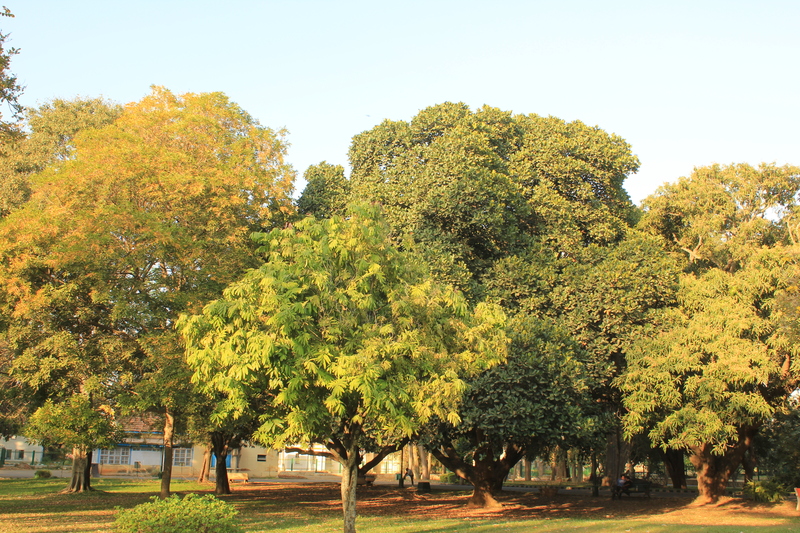 Besides being home to an endless variety of trees and plants, Lal Bagh also has several vintage buildings which house offices and labs of the horticultural department. The sacred Baelfruit tree had photos of deities all around it. 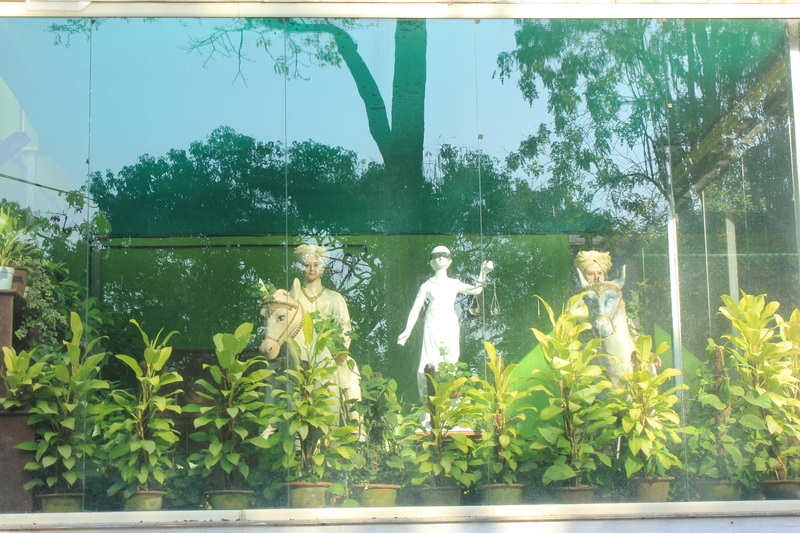 And someone had placed a tiny idol of Goddess Lakshmi in between the branches. I was awestruck by the beauty of this palm tree especially its trunk. 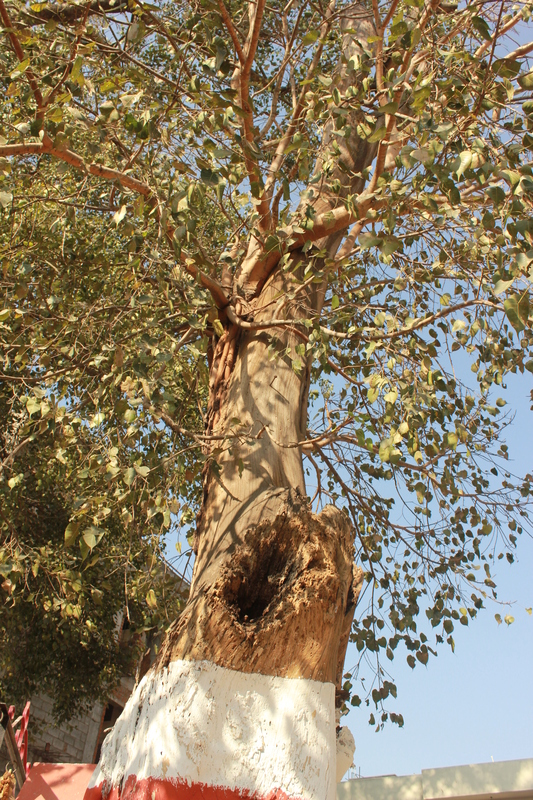 There were a lot of trees growing out from its trunk one of which was unmistakably the Peepal. I found it hard to take my eyes off this amazing variety of trees. 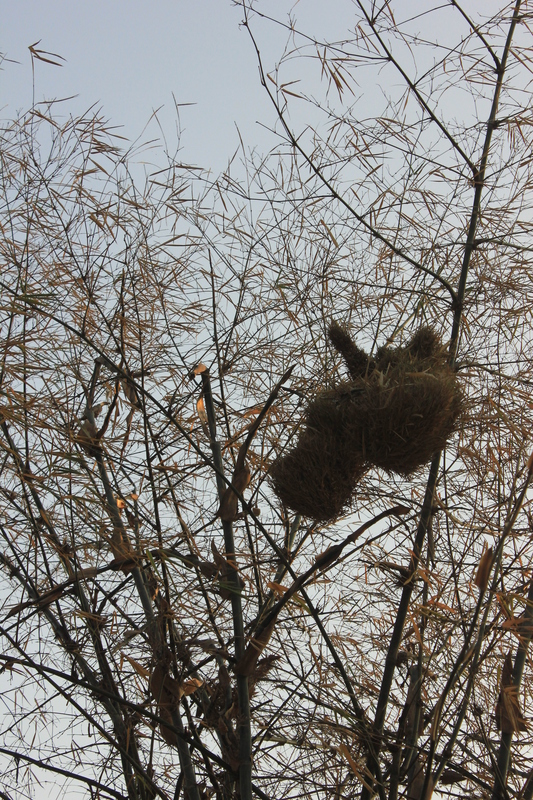 I noticed this large nest among a cluster of bamboos. 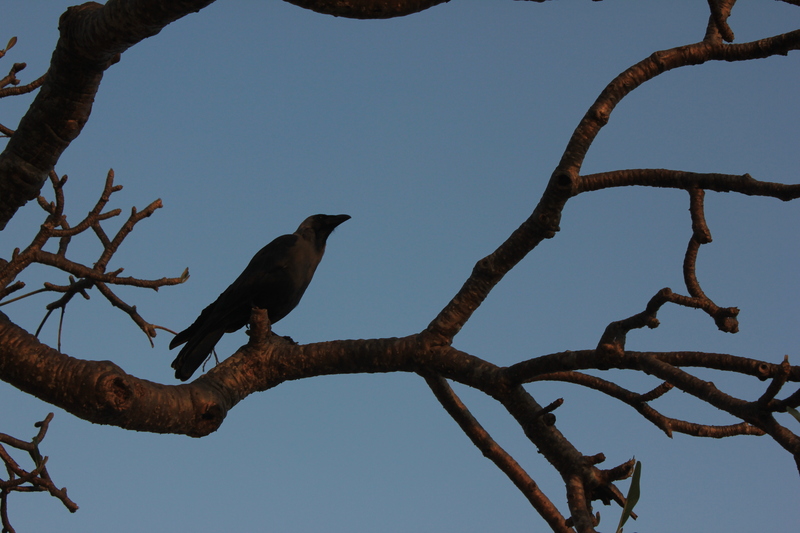 The crows of Lal Bagh are a friendly lot. 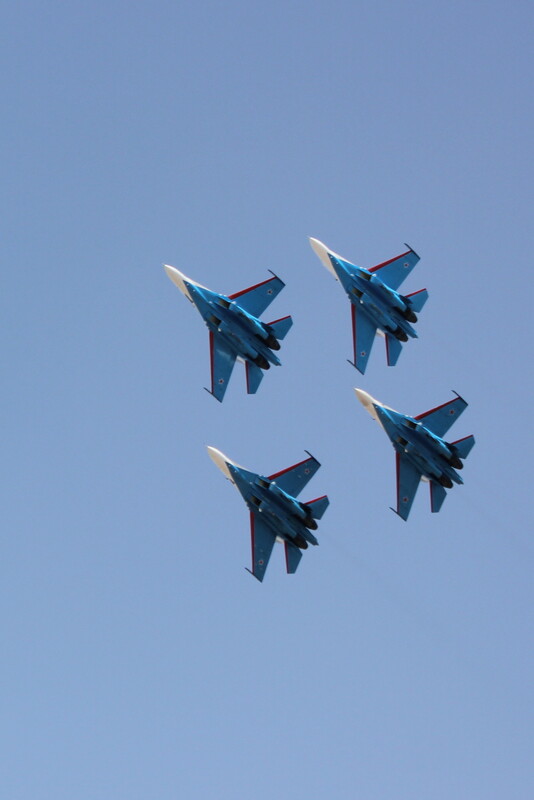 They allow you to photograph them from close quarters. 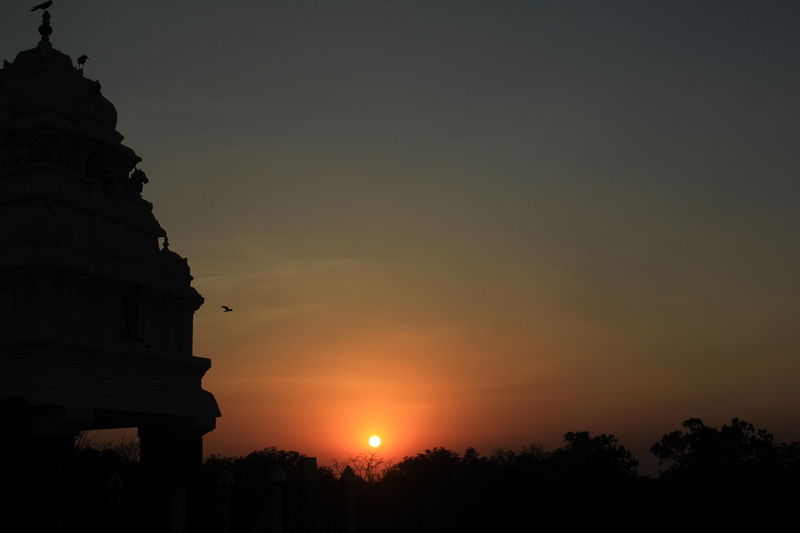 And after the sun went home, I decided to leave for my home with memories of yet another enchanting time at my favourite place in Bangalore. 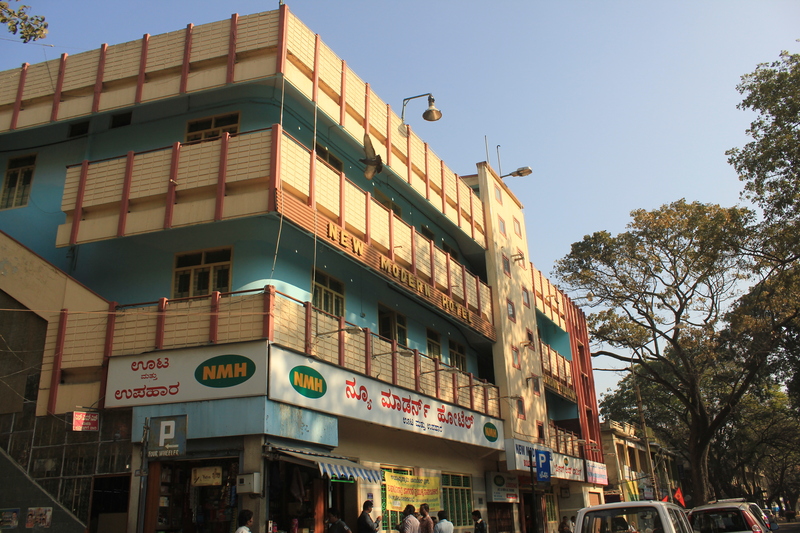 An early morning photo-walk through V V Puram evoked memories of vintage Bangalore famous for its sylvan beauty and laid back lifestyle. 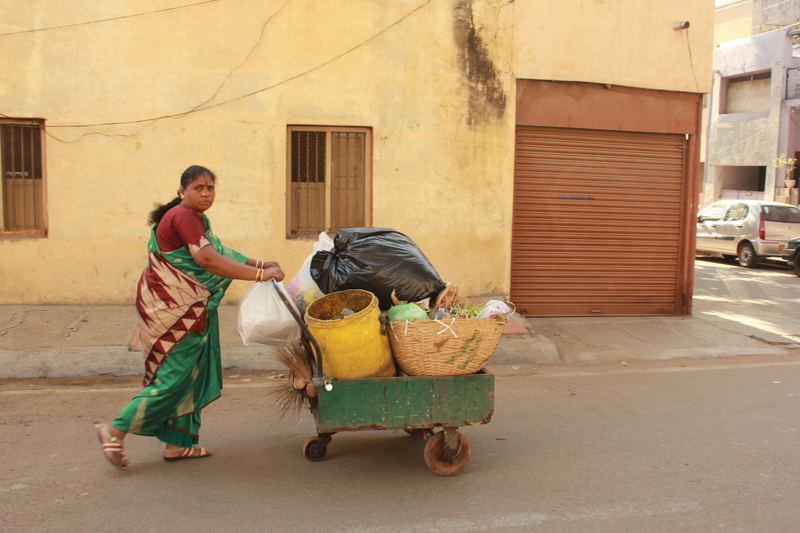 Led by ace photographer Vivek Muthuramalingam, the walk, which was part of Neralu, The Bengaluru Tree Festival, started at 7.30am on a lovely Sunday morning when the charming locality was slowly waking up. 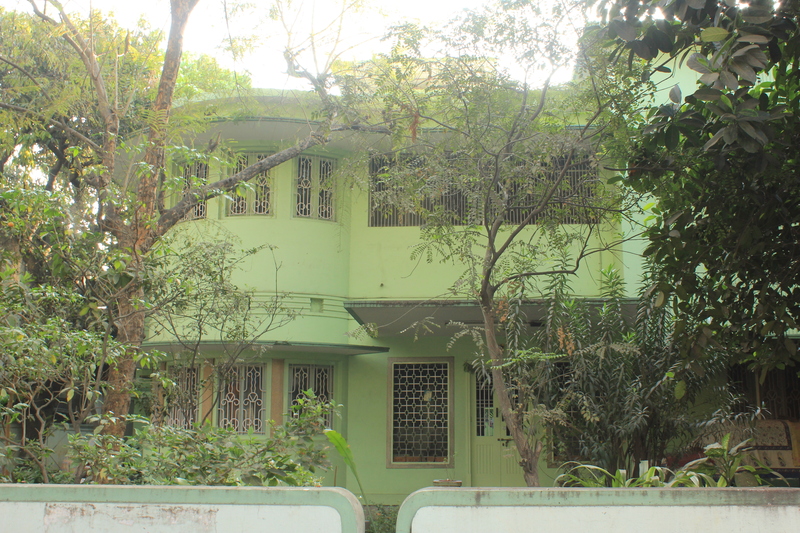 The broad tree-lined roads skirted by palatial vintage bungalows and buildings, temples and apartment blocks were a treat to walk on. The air smelt sweet thanks to the breeze from the myriad trees. 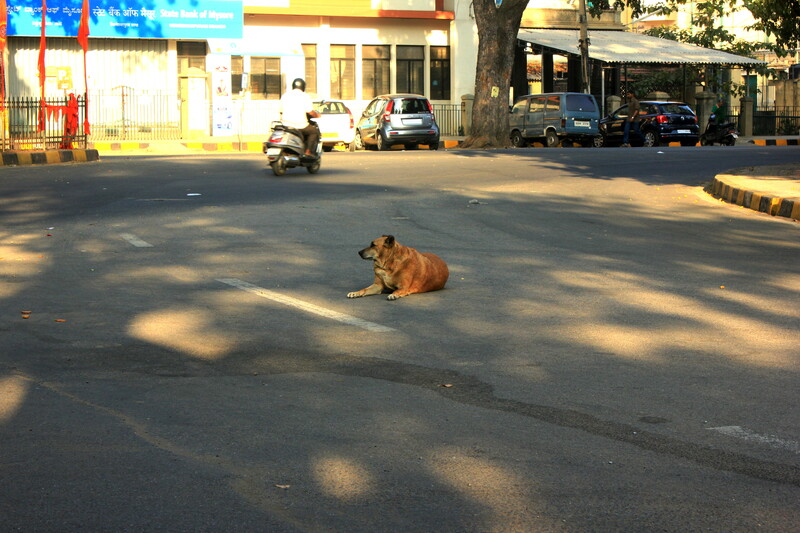 I got a start when I saw this dog resting at the centre of the road. I tried shooing him off to the pavement but he wouldn’t budge. 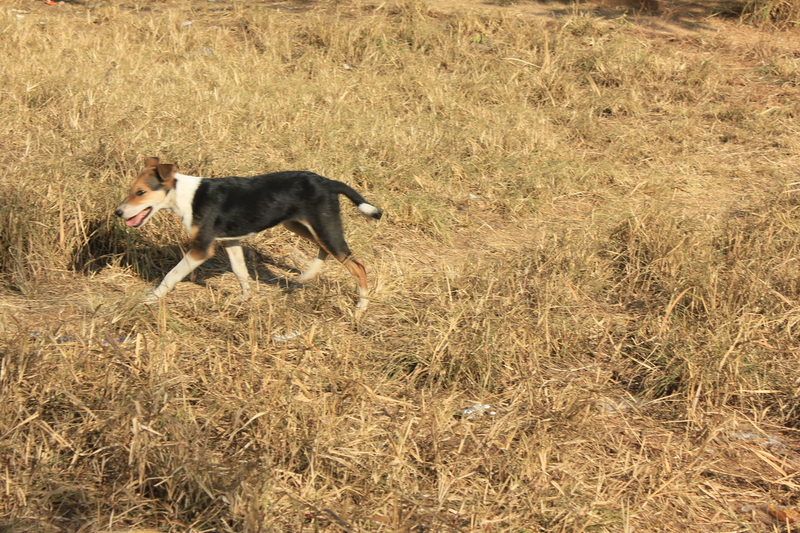 A man who came to feed him biscuits tells me that resting at the centre of the road is a habit with this dog. He allayed my fears that the dog may get run over. 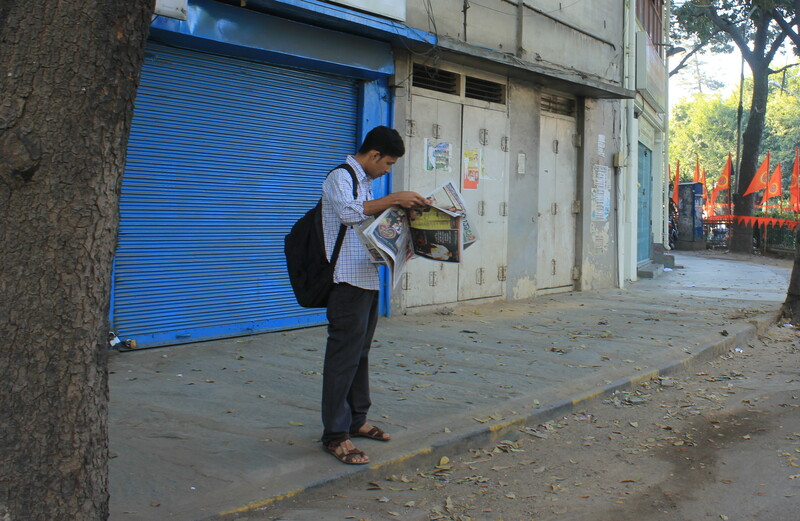 Most of us cannot do without two things in the morning – a cup of coffee and and the newspaper. 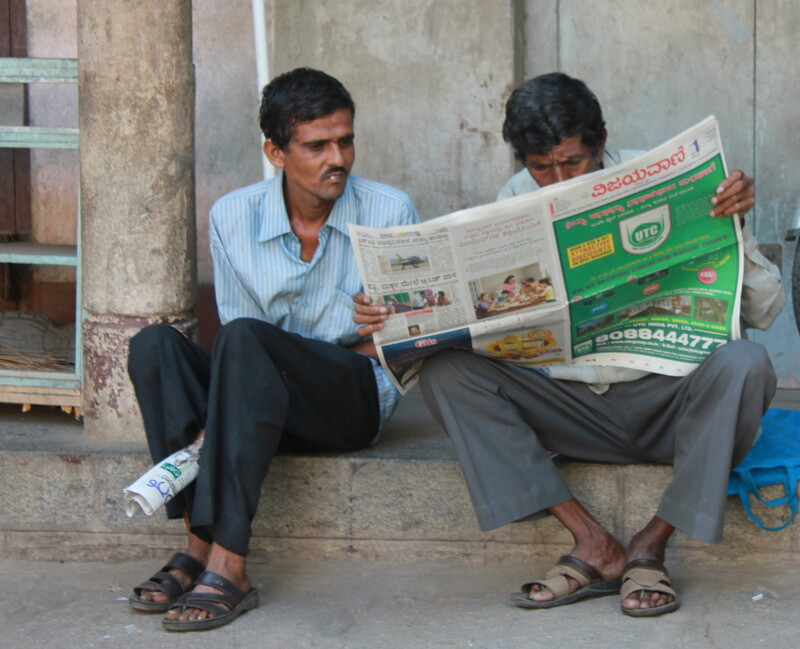 So engrossed were these men with the news that they hardly felt the presence of shutterbugs clicking around them. 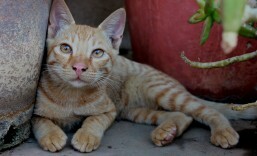 The newspaper vendor’s pet made for a cute click. A lot of shops hadn’t opened. 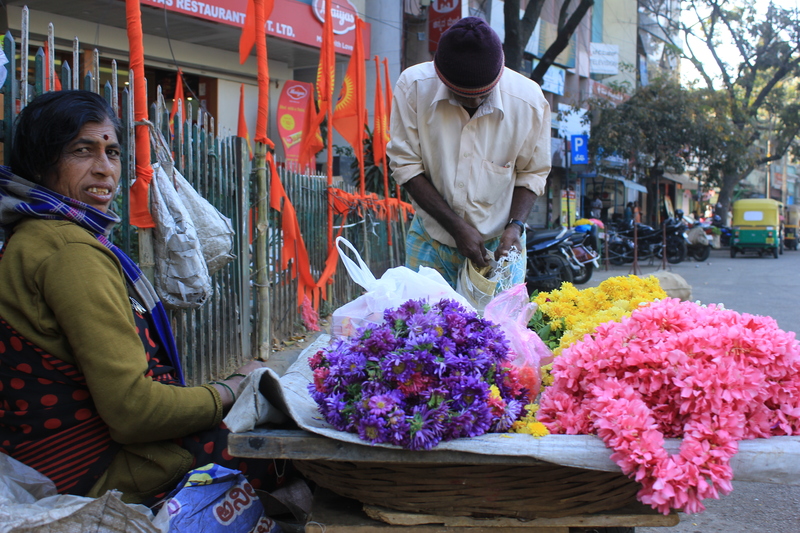 The neighbourhood flower seller had just started her day. 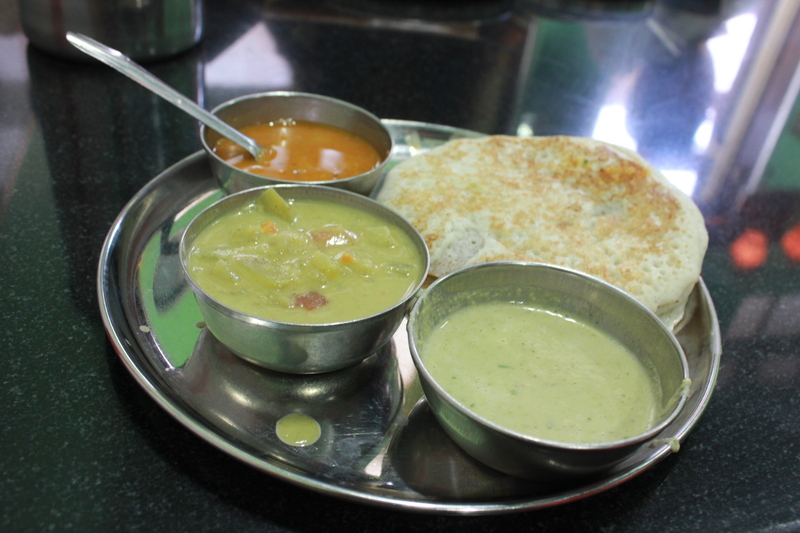 In contrast to the near-empty roads, Hotel Janatha, an old-time V V Puram favourite, was packed. 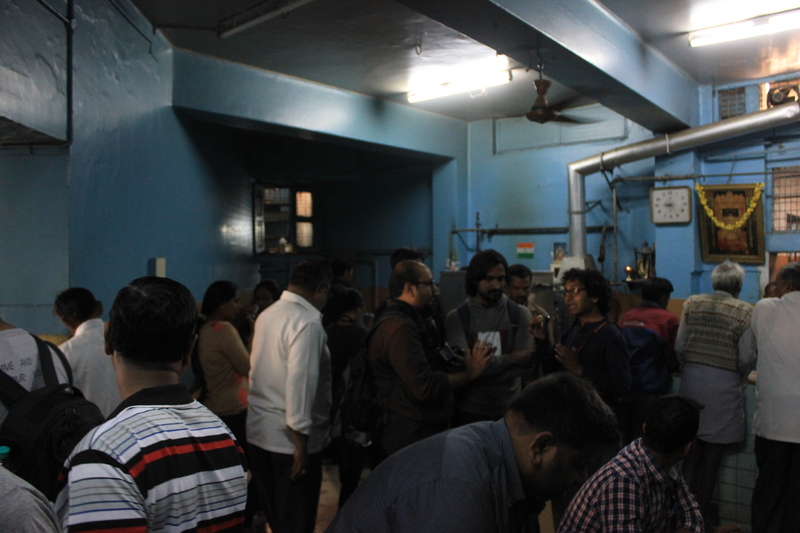 The smell of filter coffee was all over. 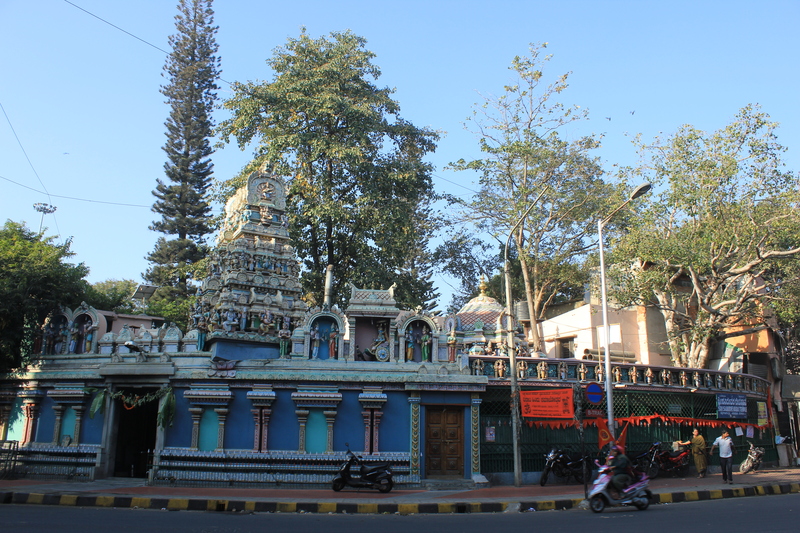 The atmosphere on Vasavi Temple Street was absolutely divine and serene. 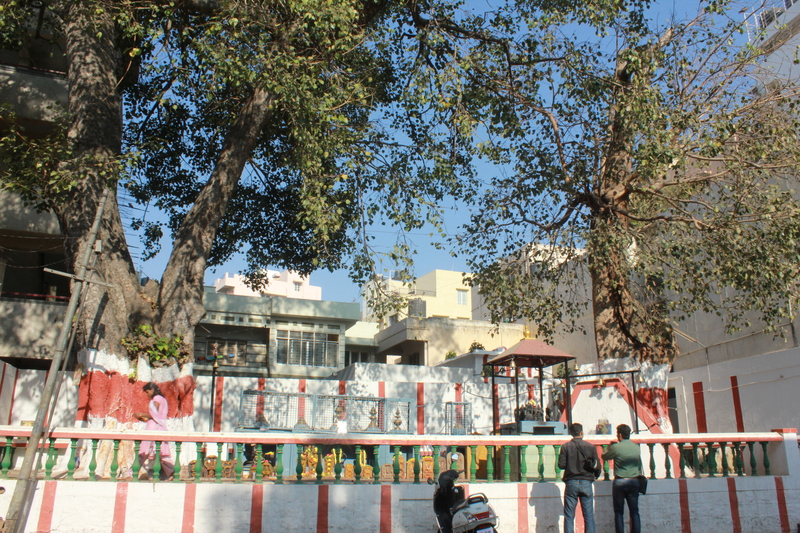 The park across Vasavi Temple added to the charm of the place. On the street adjacent to the famous NMH (short for New Modern Hotel), someone’s pet dog sensing strangers was on a barking spree. I couldn’t get a good picture of the bundle of energy though. 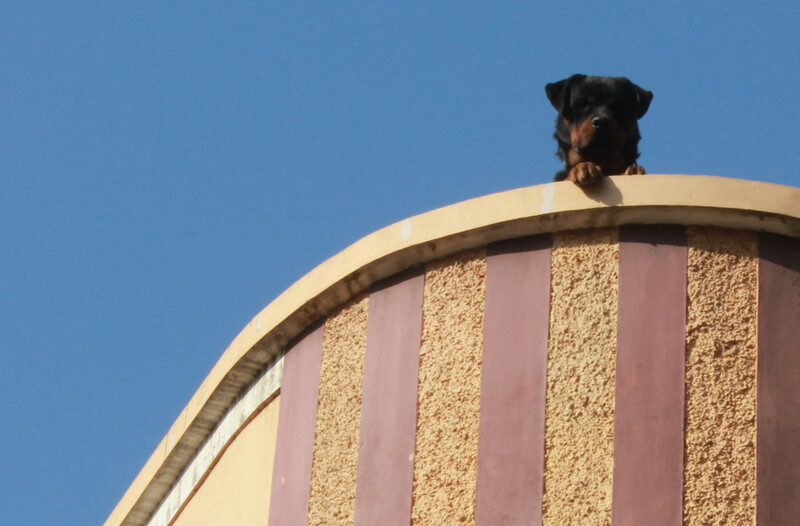 He was perched high up on the terrace of his home. 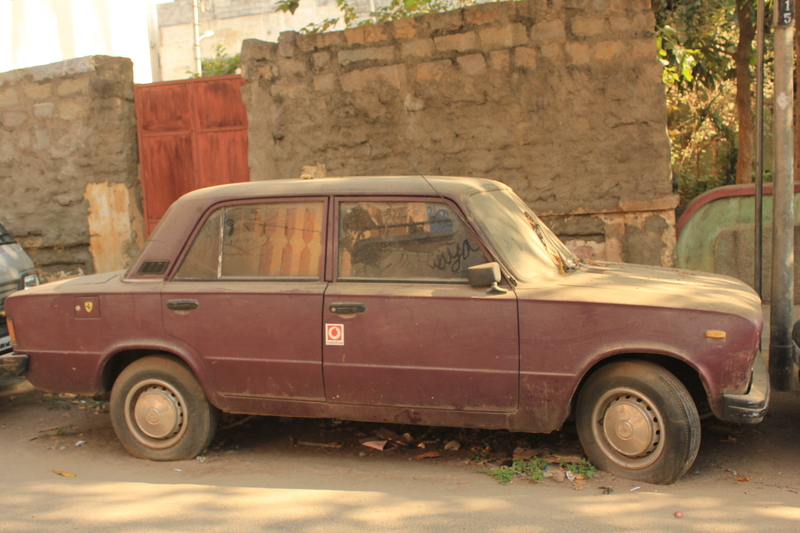 This old car once somebody’s prized possession was sadly lying abandoned on the road.